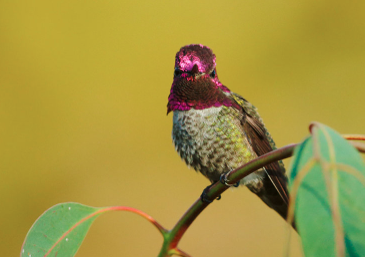 The variety of different habitats that Calypte anna occupy along the Western Coast of the United States expose this hummingbird to a vast array of food sources. A study conducted by Gary F. Stiles, published by the American Association for the Advancement of Science, concluded that the abundance and distribution of nectar producing flowers is essential when Anna’s hummingbirds select a territory (Stiles, 1971). Calypte anna is recognized for having high metabolisms, which allow them to expend energy rapidly. Because of this, the Anna’s hummingbird must obtain and utilize the food sources and nutrients available in their environments often (Eberhard and Ewald, 1994). They acquire these nutrients from a variety of food sources including; flower nectar, tree sap, sugar-water mixtures from feeders and arachnids. The way they utilize the food sources and their nutrients is remarkable. Their primary source of energy comes from the nectar of flowers and garden feeders and their protein source comes predominantly from insects, primarily flies and spiders. The nectar from the flowers provides energy that will last for several hours, while the insects contribute very little energy (Stiles, 1971). The Anna’s hummingbird has a mutualistic relationship with flowers. 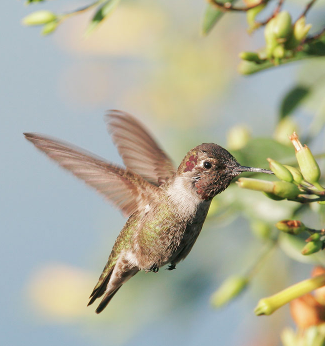 The sweet flower nectar supplies the hummingbird with nutrients necessary for survival, and in return the hummingbird plays a major role in flower pollen distribution (California Bureau of Land Management). While they have been recorded feeding on red gooseberry, tree tobacco and tree sap, numerous studies have reported that the Anna’s hummingbird prefers the most nectar-rich species of flowers like Ribes speciosum and Eucalyptus globulus (Stiles, 1971). The Anna’s hummingbird is known for being exceptionally territorial and anti-social. Territoriality and increasing control over food resources in their environments allow the hummingbirds to spend less time scavenging and more time defending their territories (Eberhard and Ewald, 1994). In order to defend their terrain, they have developed a defense mechanism that involves chasing away intruders from their breeding and feeding grounds. According to a study published on the Cost of Territory Establishment in Hummingbirds, longer chases decrease the amount of intruders into a territory because they imply that the space is occupied (Copenhaver and Ewald, 1980). Since they are not social birds, interactions with other organisms are often limited. However, there are some primary predators that these hummingbirds have to avoid include. Predators worth avoiding include carnivorous birds such as stellar jays and hawks, along with other species including domestic house cats, lizards and the occasional snake, as each of these species pose a threat to the hummingbird (California Bureau of Land Management). Occasionally the Anna’s hummingbird encounters a yellowjacket wasp or bee while consuming a sugar-water mixture at a feeder. This encounter prevents the hummingbirds from successfully feeding in their territories, as the wasps and bees are very aggressive (Copenhaver and Ewald, 1980). There have also been instances when the bees and wasps become skewered on the bill of a hummingbird, ultimately causing the death of both organisms. Return to Home Page Go to Interesting Facts!